Cultivar: `MIDWEST' MANCHURIAN CRABAPPLE - a hardy, uniform seed propagated selection from the USDA Bismarck, PMC. A small to medium sized, roundheaded tree reaching a height of 15 to 25 feet. It is native from northeastern Asia to northern China. 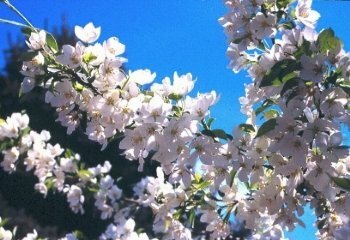 White flowers appear in May followed by the ¼" to ½" yellow or red fruits in October. Select One Bundle of 50 5"-9"